house of spoon: Game on!! 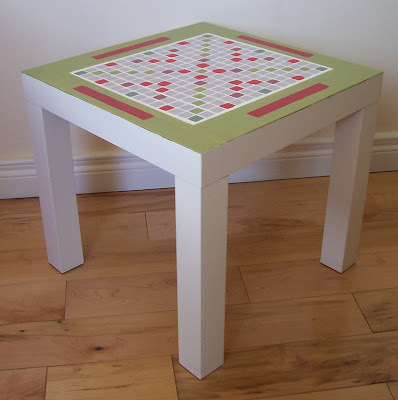 Well...i did say i'd post the pic of the re-engineered scrabble board soon, so here it is. 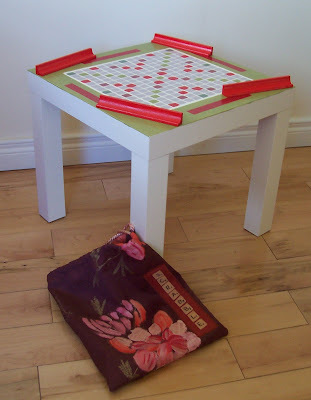 I tried a number of times to measure the squares on a scrabble board and simply rule the grid out, but was foiled repeatedly as the squares are actually not even the same size...grrrr! So in the end I traced 2 rows of squares onto acetate, cut them out with a craft knife and just used it as a stencil to draw the squares in pencil onto the table. I tried to stencil with paint directly but the fact that the lines between the squares are so narrow meant that i kept getting leakage from one square to the next....aka a smudgey mess. Anyway, i decided to give up and painted each square by hand. I painted red boxes for the little tile holders which had been painted pillar-box RED by SuperD. How spiffing! Am I allowed that word? Do I get an extra 50 points because I'm the first to comment on your table? I would like to try out the table with mugs and biscotti, count me in for the next game!! Yum Yum. faith, love, hope and enLIGHTenment! how's the game goin?...it's in the bag!